Supreme is a highly experienced and reputable building company. We offer clients a range of specialised services from planned maintenance and refurbishments to emergency response and complete new builds. We work with both the private and commercial sectors and along with our highly skilled team are able to offer our clients the highest level of customer service and workmanship. Supreme are able to offer both planned and response maintenance in building, electrical, plumbing, heating and gas works. All work is carried out to a level to suit each customer’s individual requirements. We can provide both Landlord Gas Safety Certification and NICEIC Electrical Certification. We also provide PAT (Portable Application Testing) to check the safety of your electrical appliances and equipment and EPC (Energy Performance Certification) to test your energy efficiency and make recommendations on how to reduce energy expense. Our shop fitters are members of the Institute of Carpenters and are highly qualified and skilled. Many past accounts have included banks, stock market trading rooms and legal firms. Supreme’s roofing division has been long established with the London Borough of Camden, Barnet, Haringey, Enfield and other housing associations. As well as offering conventional roofing methods we are approved contractors for Centaur CQP, which offers levels of performance and reliability that are quite simply unsurpassed. Supreme are an approved Contractor for Remtox and BioKill (chemical damp proof courses and timber treatment) and is a John Newton Approved Contractor for basement water-proofing systems. We offer full remedial services, including: preparation, hacking off, rendering, plastering, carpentry/joinery and basement tanking. We also offer chemical treatments for rising damp, dry rot, wet rot and woodworm. We can also provide services for thermal and sound insulation works. For more information on any of our services, contact Supreme today. 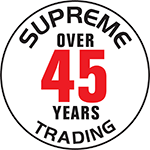 Supreme are a company of specialists who provide building, maintenance, repair, plumbing, heating, roofing, electrical, damp proofing, and decorating work. Our aim is to provide a business that you can rely on for all of your home and commercial building solutions. We have spent almost 50 years establishing ourselves as a company you can trust.